Unfortunately time constraints (i.e my day job) keep getting in the way of me updating this site so all Ive been able to do so far for the Derby Nickname page is a very basic bit of background. 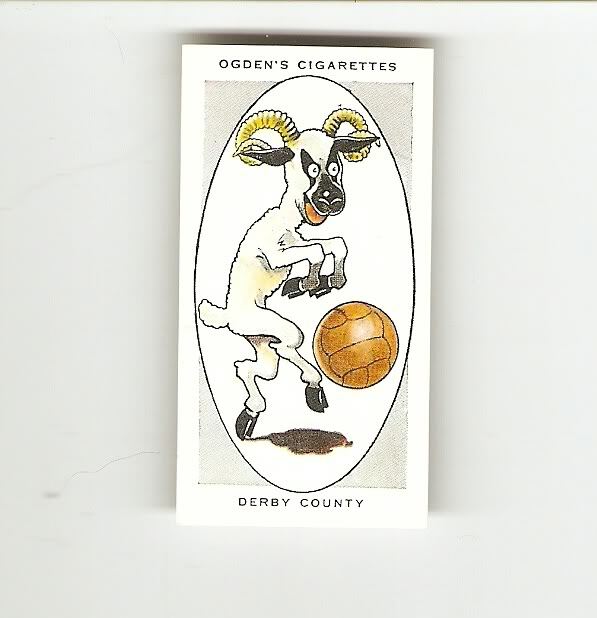 Ive shown below a football cigarette card from the Ogdens AFC Nicknames series that shows a caricature that depicts a "Ram", which of course is Derbys nickname !! "Derby County have always been called the “Rams” and they are depicted for illustrative purposes in the guise of one of these sprightly animals. The derivation of the name is not obvious, but it is supposed to be drawn from the agricultural pursuits of the county, amounted rams head is hung in the directors room at the back of the stand. Founded in 1884 the County has been aprominent League club, several players having won great distinction. One of the most brilliant was Bloomer, who scored352 goals in League matches and also obtained 28 in International matches. During his day Bloomer had no rival as an inside right". So, there you have it, a very brief account of the famous Derby County "Rams" nickname, there is of course a lot more to it than that and I will be coming back to this page as soon as possible to update it.